And I'd like to point out that every global warming thinking scientist has exaggerated all the data for their own self serving purpose. 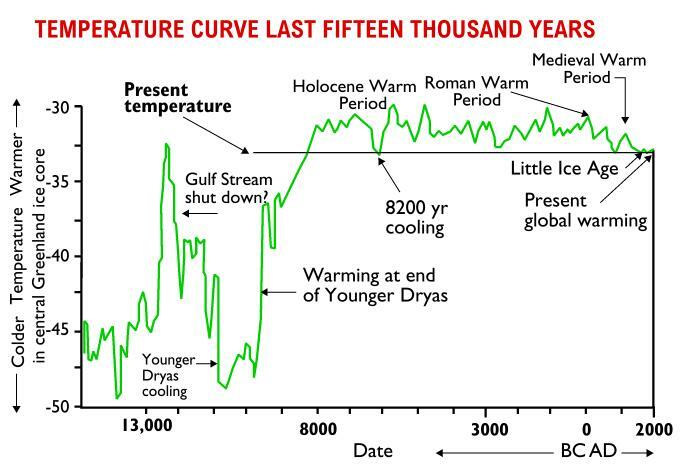 We haven't even hit the climate of the Medieval maximum or the Roman warm period yet. This climate upswing might turn out to be colder then the previous two. A. Even Wikipedia is more legit than some random guy on a message board who doesn't provide any evidence at all. Why didn't you call him out? Such a double standard and complete intellectual dishonesty on your part. B. For those too lazy to click the link provided and scroll down to the bottom of the page, I've posted the peer reviewed scientific journal articles that the graph was created from. (blue 1000-1980): M.E. Mann, R.S. Bradley, and M.K. Hughes (1999). "Northern Hemisphere Temperatures During the Past Millennium: Inferences, Uncertainties, and Limitations". Geophysical Research Letters 26 (6): 759-762. (lightest blue 1402-1960): K.R. Briffa, T.J. Osborn, F.H. Schweingruber, I.C. Harris, P.D. Jones, S.G. Shiyatov, S.G. and E.A. Vaganov (2001). "Low-frequency temperature variations from a northern tree-ring density network". J. Geophys. Res. 106: 2929-2941. (light turquoise 831-1992): J. Esper, E.R. Cook, and F.H. Schweingruber (2002). "Low-Frequency Signals in Long Tree-Ring Chronologies for Reconstructing Past Temperature Variability". Science 295 (5563): 2250-2253. doi:10.1126/science.1066208. (green 200-1980): M.E. Mann and P.D. Jones (2003). "Global Surface Temperatures over the Past Two Millennia". Geophysical Research Letters 30 (15): 1820. doi:10.1029/2003GL017814. The original version of this figure was prepared by Robert A. Rohde from publicly available data, and is incorporated into the Global Warming Art project. is this accurate or even relevant? Yup, no conflict of interest there. Legit indeed. lA forecast in the 2007 report that hurricanes would become more intense has simply been dropped, without mention. Despite the many scientific uncertainties disclosed by the leaked report, it nonetheless draws familiar, apocalyptic conclusions – insisting that the IPCC is more confident than ever that global warming is mainly humans’ fault. It says the world will continue to warm catastrophically unless there is drastic action to curb greenhouse gases – with big rises in sea level, floods, droughts and the disappearance of the Arctic icecap. Starting a week tomorrow, about 40 of the 250 authors who contributed to the report – and supposedly produced a definitive scientific consensus – will hold a four-day meeting in Stockholm, together with representatives of most of the 195 governments that fund the IPCC, established in 1998 by the World Meteorological Organisation (WMO) and the United Nations Environment Programme (UNEP). The governments have tabled 1,800 questions and are demanding major revisions, starting with the failure to account for the pause. Prof Curry said she hoped that the ‘inconsistencies will be pointed out’ at the meeting, adding: ‘The consensus-seeking process used by the IPCC creates and amplifies biases in the science. It should be abandoned in favour of a more traditional review that presents arguments for and against – which would better support scientific progress, and be more useful for policy makers.’ Others agree that the unwieldy and expensive IPCC assessment process has now run its course. Climate change sceptics are more outspoken. Dr Benny Peiser, of the Global Warming Policy Foundation, described the leaked report as a ‘staggering concoction of confusion, speculation and sheer ignorance’. As for the pause, he said ‘it would appear that the IPCC is running out of answers . . . to explain why there is a widening gap between predictions and reality’. The Mail on Sunday has also seen an earlier draft of the report, dated October last year. There are many striking differences between it and the current, ‘final’ version. The 2012 draft makes no mention of the pause and, far from admitting that the Middle Ages were unusually warm, it states that today’s temperatures are the highest for at least 1,300 years, as it did in 2007. Prof Allen said the change ‘reflects greater uncertainty about what was happening around the last millennium but one’. A further change in the new version is the first-ever scaling down of a crucial yardstick, the ‘equilibrium climate sensitivity’ – the extent to which the world is meant to warm each time CO2 levels double. As things stand, the atmosphere is expected to have twice as much CO2 as in pre-industrial times by about 2050. In 2007, the IPCC said the ‘likeliest’ figure was 3C, with up to 4.5C still ‘likely’. Now it does not give a ‘likeliest’ value and admits it is ‘likely’ it may be as little as 1.5C – so giving the world many more decades to work out how to reduce carbon emissions before temperatures rise to dangerous levels. As a result of the warming pause, several recent peer-reviewed scientific studies have suggested that the true figure for the sensitivity is much lower than anyone – the IPCC included – previously thought: probably less than 2C. Last night IPCC communications chief Jonathan Lynn refused to comment, saying the leaked report was ‘still a work in progress’. The British Met Office has issued ‘erroneous statements and misrepresentations’ about the pause in global warming – and its climate computer model is fundamentally flawed, says a new analysis by a leading independent researcher. Nic Lewis, a climate scientist and accredited ‘expert reviewer’ for the IPCC, also points out that Met Office’s flagship climate model suggests the world will warm by twice as much in response to CO2 as some other leading institutes, such as Nasa’s climate centre in America. The Met Office model’s current value for the ‘equilibrium climate sensitivity’ (ECS) – how much hotter the world will get each time CO2 doubles – is 4.6C. This is above the IPCC’s own ‘likely’ range and the 95 per cent certainty’ level established by recent peer-reviewed research. Lewis’s paper is scathing about the ‘future warming’ document issued by the Met Office in July, which purported to explain why the current 16-year global warming ‘pause’ is unimportant, and does not mean the ECS is lower than previously thought. Lewis says the document made misleading claims about other scientists’ work – for example, misrepresenting important details of a study by a team that included Lewis and 14 other IPCC experts. The team’s paper, published in the prestigious journal Nature Geoscience in May, said the best estimate of the ECS was 2C or less – well under half the Met Office estimate. 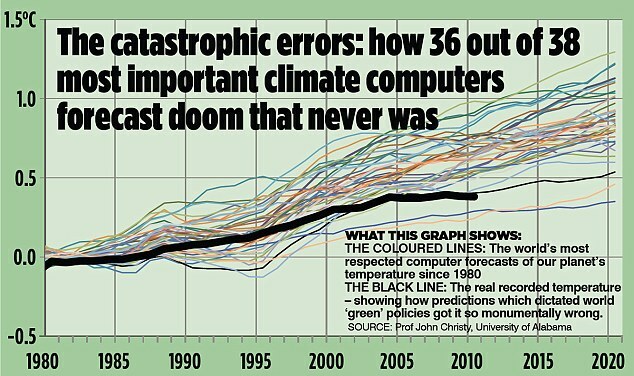 He also gives evidence that another key Met Office model is inherently skewed. The result is that it will always produce high values for CO2-induced warming, no matter how its control knobs are tweaked, because its computation of the cooling effect of smoke and dust pollution – what scientists call ‘aerosol forcing’ – is simply incompatible with the real world. This has serious implications, because the Met Office’s HadCM3 model is used to determine the Government’s climate projections, which influence policy. Mr Lewis concludes that the Met Office modelling is ‘fundamentally unsatisfactory, because it effectively rules out from the start the possibility that both aerosol forcing and climate sensitivity are modest’. Yet this, he writes, ‘is the combination that recent observations support’. The Met Office said it would examine the paper and respond in due course. The Mail on Sunday’s report last week that Arctic ice has had a massive rebound this year from its 2012 record low was followed up around the world – and recorded 174,200 Facebook ‘shares’, by some distance a record for an article on the MailOnline website. But the article and its author also became the object of extraordinarily vitriolic attacks from climate commentators who refuse to accept any evidence that may unsettle their view of the science. A Guardian website article claimed our report was ‘delusional’ because it ignored what it called an ‘Arctic death spiral’ caused by global warming. Beneath this, some readers who made comments had their posts removed by the site moderator, because they ‘didn’t abide by our community standards’. But among those that still remain on the site is one which likens the work of David Rose – who is Jewish – to Adolf Hitler’s anti-Semitic rant Mein Kampf. Critics of the article entirely ignored its equally accurate statement that there is mounting evidence the Arctic sea ice retreat has in the past been cyclical: there were huge melts in the 1920s, followed by later advances. Wait, if the scientists are lying, how come they didn't lie about this? Why do you trust these reports of the scientists more than previous reports? Can you at least recognize your own biases? The same as theirs, Trust me I'm not in it for the money though. It would be nice to have the original data source. In some of the similar charts I have seen there has been a recent warming that is still below maximums over the last 100 years. The differences could be due to different locations being reported. As far as relevance, data is always relevant. In this case it is akin to using a thermometer embedded in a block of ice inside your freezer to tell when your electricity is out. You'll eventually get the right answer, but this will be a trailing indicator rather than a leading indicator. In all likelihood, this is already affecting everyone. There is no avoiding the economic impact. You do understand that warm times are good times right? In non-industrial countries it certainly is. Warm times increase the growing season, open up more land for agriculture, and lead to a rise in population. Warm times are when great societies and cultures flourish as there is population to support them. Cold times are not. Cold times lead to the collapse of societies, drastic reductions in population, war, famine, and death. The low middle ages were so bad compared to Roman times and the high middle ages because Europe simply didn't have the population to support large states for hundreds of years. Even a fertile place like Egypt suffered in cold times. The intermediate periods between the kingdoms correspond with downturns in temperature. Just now we are seeing barley being grown in Greenland which was common during the medieval warm period and the UK getting its wine industry back which was also common during the medieval warm period. Thank God this catastrophe is developing more slowly than we thought. This gives us more years to fund research and mitigation measures before it's too late! Climate change involves more than temperature. Droughts will become more frequent and longer. When it does rain, the events are predicted to be more intense (more flooding). Diseases becomes more prevalent. Ocean acidificaton can result in ecosystem collapses. Fresh water will become more scarce. People will be displaced.